All photos by Rich Kowalski unless otherwise stated. "What a trip! And I wasn't on anything I swear. Delicious psychotropic madness!" Mike Edison, former editor/publisher of counterculture magazine HIGH TIMES and the author of I Have Fun Everywhere I Go. "I loved the creepy cinematic quality of the production. So many scenes spooled out like movie clips from a film by, say, Tim Burton, or maybe Terry Gilliam. Excellent work!" Robert Festinger, Oscar nominated screenwriter (In the Bedroom). "Awesome." Weird Tales, Hugo Award winning fantasy and horror fiction pulp magazine first published in 1923. 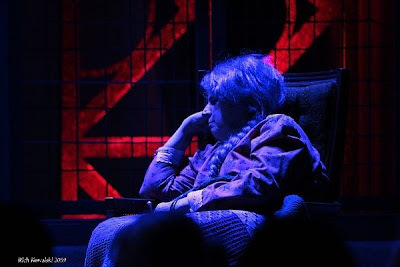 "I really enjoyed the play: beautifully staged; funny; inventive. I liked it better than the film; it was darker; more playful; philosophical. 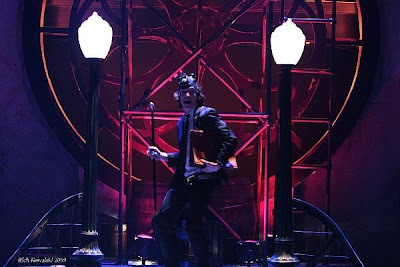 And I loved those Orson Welles lights shooting up from the stage! I was singing "All the Young Dudes" the whole week. I'm serious! Well done." Robert Kaplow, whose novel, Me and Orson Welles, a valentine to the burly thespian, was recently turned into a movie by indie filmmaker Richard Linklater (Dazed & Confused). It stars Zac Efron, Claire Danes, and Christian McCay as Welles. Film critic Roger Ebert called Me and Orson Welles the "best movie about theater" he'd ever seen. 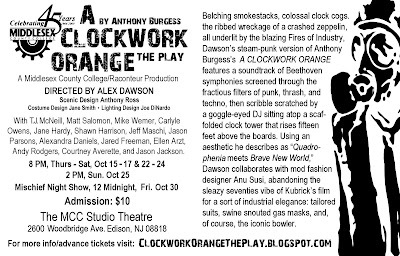 "Alex Dawson’s production of CLOCKWORK ORANGE at Middlesex County College was striking in several ways. 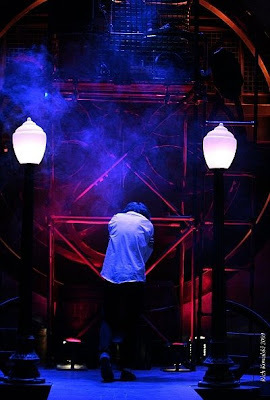 First, it is a dynamic adaptation for the stage that takes advantage of everything live theater has to offer. Second, it draws on the talents of a fine collection of gifted, local artists. 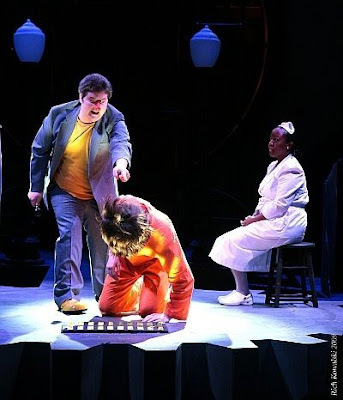 Third, it showcases the Theater Department at Middlesex County College as a cutting edge theater producer, putting the college on the map as a destination for theatergoers in central New Jersey." Grace Shackney, Administrative Director of THE MCCARTER THEATER (widely recognized as one of the country's leading theaters). "Have you ever felt breathless? 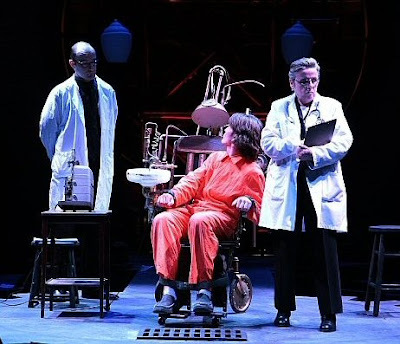 Well, that's how you feel (and FEEL is the operative word here) when you watch Alex Dawson's electrifying adaptation of A CLOCKWORK ORANGE at Middlesex County College. 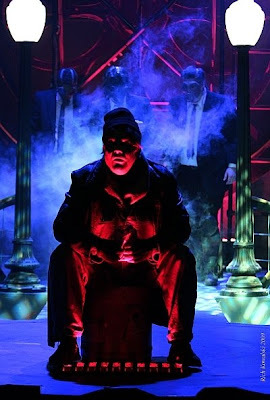 What Dawson and the talented cast have done is utilized the unique elements of theater: the dialogue, the way lighting and setting can create mood and atmosphere, the ability theater has to transport us into a completely different world, into another person's psyche. 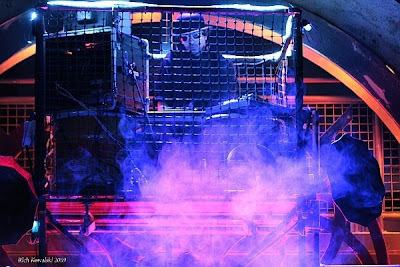 Dawson's production is a carnival ride, and it will leave you breathless. 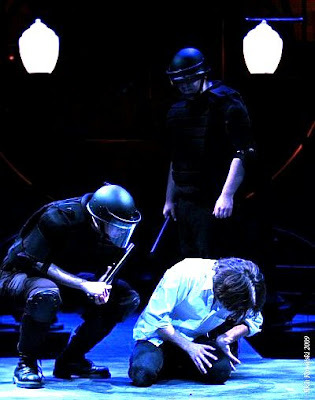 A CLOCKWORK ORANGE is thinking persons' theater, which makes it an ideal match with MCC. College is where we go to be stimulated, challenged, tested. It is time during which we begin to think for ourselves. 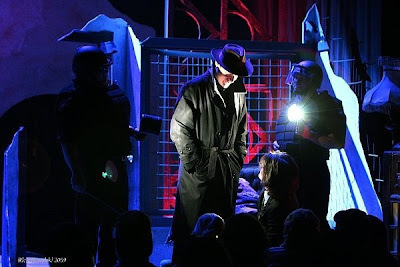 I live locally, love theater, and, over the years, have attended quite a few productions at MCC. 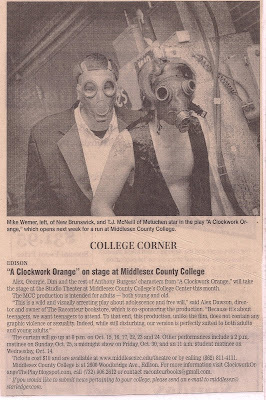 In presenting A CLOCKWORK ORANGE, MCC not only achieved a level of artistic excellence I had not seen there before, they also richly fulfilled their mission as a true center of education. Bravo to the crew, the cast, and to the receptive audiences. I hope this is just the beginning of a long and thrilling association between MCC and Alex Dawson." 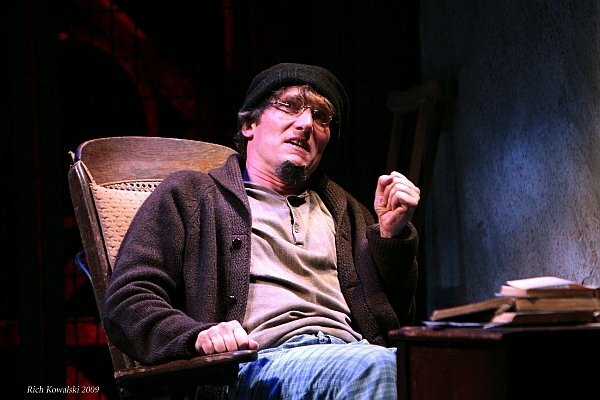 Tom Lynch, former editor of THEATRE WORLD, the oldest (first published in 1945), pictorial and statistical record of the American theatre, including Broadway, Off-Broadway, Off-Off-Broadway, and regional theatre. 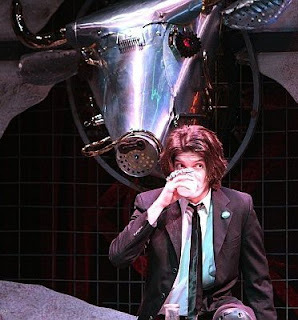 In 2001, it recieved a special Tony for Excellence in Theatre. 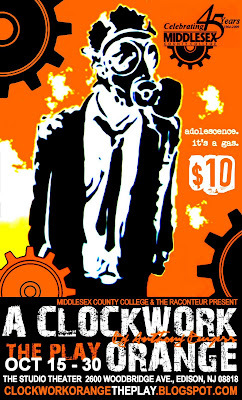 "THIS CLOCK WORKS!Local theater abounds in productions of plays you may have already seen more times than you can count, or perhaps original or obscure works that you’ve never heard of, so it takes a certain title to really catch my attention, which is what happened when I became aware that Middlesex County College was staging A Clockwork Orange. Like most avid film fans of my generation, I am well versed in Stanley Kubrick’s 1971 motion picture adaptation of Anthony Burgess’s novel, so I was very intrigued by how this might be adapted for theater. For the first time ever, I actually made it a point to see something being performed at the college, which, to my shame, I had never done before, despite living nearby. Orange did the trick. 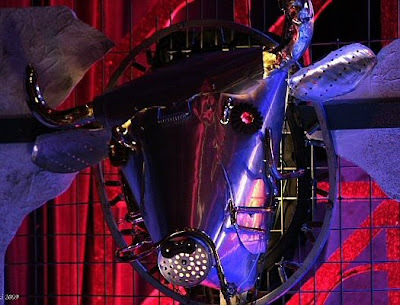 I was immediately glad I came, as the set design itself captured my fancy upon entering the auditorium, in so much as it included actual clockworks, a shiny cow’s head to depict Burgess’s famous milk bar setting, and what appeared to be an on-stage DJ. The vision was already different from Kubrick’s, so I felt I was in good hands. 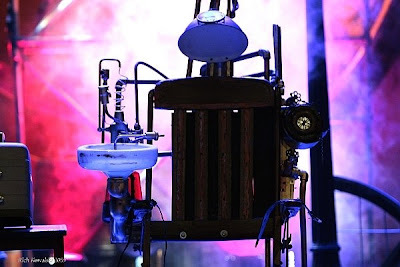 As anyone aware of the piece knows, Orange is highly unsettling, but it needs to be to make its point about how scientific alteration of one’s behavior (even vile and inhumane behavior) is not the answer to society’s problems, as it deprives the individual of his choice to be good or bad. It is an important message and I was glad to see that, as presented by Alex Dawson, it came across loud and clear, with imagination, faithfulness to the source material, and tremendous energy that made the whole thing zip by in record time. I was also very impressed with how he managed to retain the power of the piece, but without venturing into the more graphically violent or sexually explicit areas that had made the movie so controversial. Dawson, therefore, made Orange accessible to students without crossing any potentially incendiary boundaries. Having grown up when the film version was very prominent, in movie theaters, on college campuses (where it was a particular favorite), and on cable, this work was out there for everyone to experience. In recent years, I was worried that it had evaporated from the public consciousness, which would be a shame. The decision to present this new version at Middlesex is something I champion fervently; I believe it will make people think, make them seek out the original novel and movie, and make those with an interest in theater very excited about the very idea of performing themselves. And, what’s more, it will make me search out future productions that will be staged at Middlesex, hoping for the same degree of originality and daring." Barry Monush, the author of the Encyclopedia of Hollywood Film Actors: From the Silent Era to 1965 and Everybody's Talkin': The Top Films of 1965 - 1969. "EXPLOSIVE...INSPIRED...TRANSCENDENT...PROVOCATIVE. 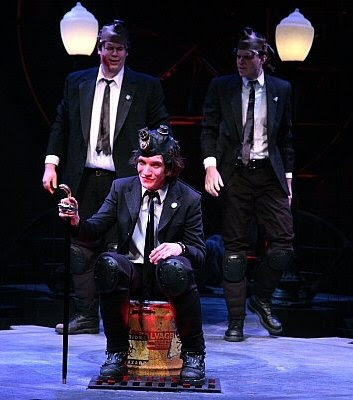 Using an explosive combination of musical accompaniment, from the Smiths to Peter Gabriel to Mott the Hoople and, of course, Alex's favorite Ludwig Van, Alex Dawson has given Anthony Burgess' A CLOCKWORK ORANGE a steampunked reinterpretation. 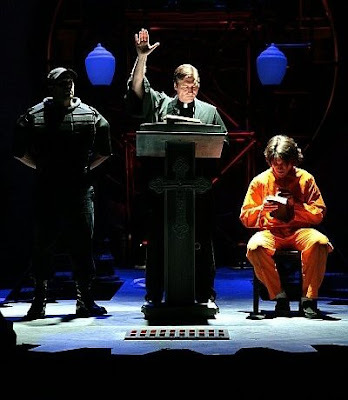 With inspired performances by T.J. McNeill as Alex, Jason Jackson as the DJ, Shawn Harrison, Jeff Maschi, Jane Smith and Metuchen's own Carlyle Owens playing multiple roles, [MCC's] A CLOCKWORK ORANGE is a compelling and provocative stage production. 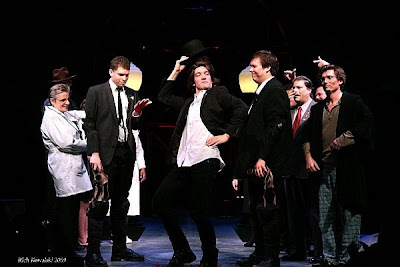 Alex, the hormonally-raging and ravaging teen tornado has been reconsidered by Dawson as "Mack the Knife meets Ferris Bueller with the coke binge elocution of Robin William's cartoon genie." 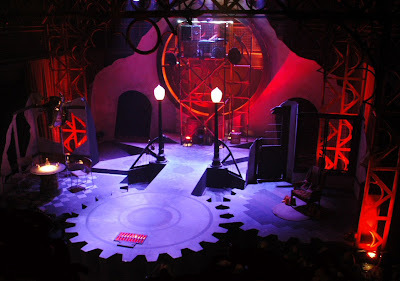 Without explicit violence and sexually graphic setpieces, A CLOCKWORK ORANGE presents Burgess' scary sneety in a nadmenny raskazz guaranteed to brosay a poogly kick to the audience's keeshkas. 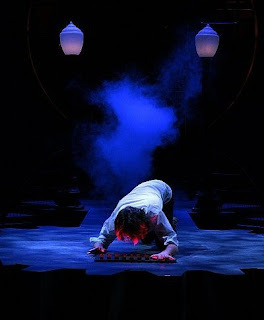 For translation and transcendent theatrical experience, get to the the show this weekend!" Janna Sicliana for MetuchenMatters.com, an online newspaper covering Metuchen and its environs. 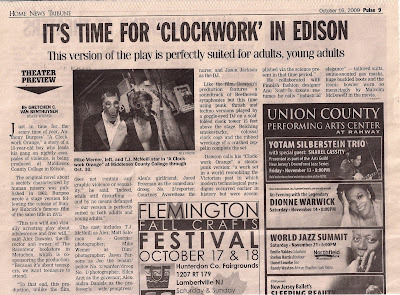 "I attended the Sunday, October 25th matinee of The Clockwork Orange and enjoyed the show immensely. 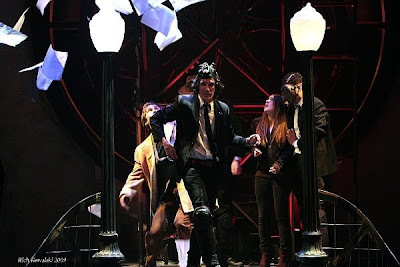 Sitting in the audience before the play began I was struck by the challenge of restructuring Anthony Burgess’ original literary work into an updated live production. It occurred to me that though the book had examined enduring social issues, it had done so through a prism that perhaps best fit the particular viewpoint of the early 1960s. An attempt to update the material, I worried, risked becoming an overly simplified and cynical exhibition of the stylistic elements that formed the frame – though not the core – of the original work. Bear in mind, this is about ten feet up. 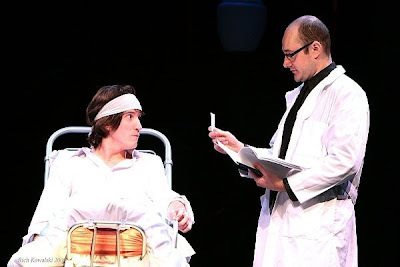 "I was beyond impressed with Alex Dawson’s provocative and irreverent staging of A Clockwork Orange, a production that far exceeded my expectations in both design and performance. 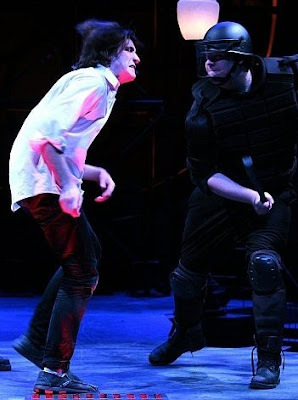 I have to believe that hosting such innovative theater will be a great advantage for the college, especially, but not limited to, the art department. I was thrilled to see such a beautiful building for the arts as well as some very talented artists on display in the gallery space. As an instructor at Montclair State University for the past four years, I have seen first hand how a greater presence of the arts can affect a college campus. It is exactly these kinds of extracurricular events that can transform a state or county school into a destination. I hope to see more in the future, and I am pleased to know that there is such an accessible venue for great performances." Chris Gash, Visiting Specialist, Illustration, Montclair University. 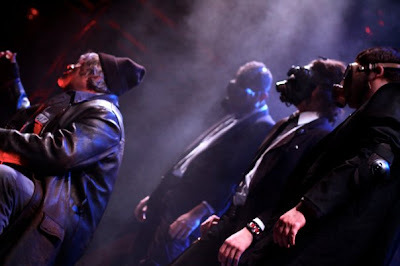 Photo taken by audience member. GOT CLOCKED THIS OCTOBER? 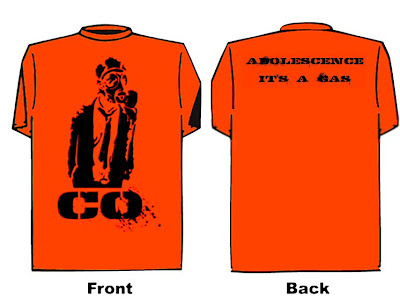 ORANGE YOU GLAD YOU DID? OR... MAYBE NOT. EITHER WAY, WE'D LOVE TO HEAR YOUR THOUGHTS. E-mail your review to us at raconteurbooks@gmail.com or post it below. 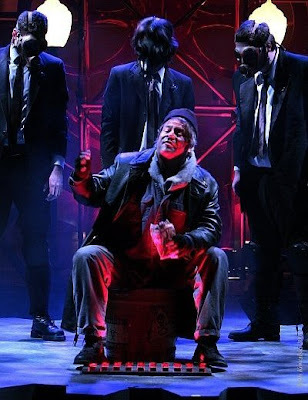 Click HERE to read the MM interview, "Alex Dawson Directs with Fire and Brimstone." Click HERE to watch the "New Jersey On Stage" televised interview with Alex Dawson. Belching smokestacks, colossal clock cogs, the ribbed wreckage of a crashed zeppelin, all under-lit by the blazing Fires of Industry, Dawson’s steam-punk version of Anthony Burgess’s A CLOCKWORK ORANGE features a soundtrack of Beethoven symphonies screened through the fractious filters of punk, thrash, and techno, then scribble scratched by a goggle-eyed DJ sitting atop a scaffolded clock tower that rises fifteen feet above the boards. 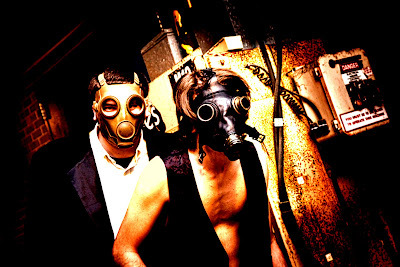 Using an aesthetic he describes as “Quadrophenia meets Brave New World,” Dawson collaborates with mod Finnish fashion designer Anu Susi, abandoning the sleazy seventies vibe of Kubrick’s film for a sort of industrial elegance: tailored suits, swine snouted gas masks, huge buckled boots and, of course, the iconic bowler.